The current article in this series provides responses related to the preferential allotment of stock warrants / share warrants to promoters. Stock warrants are insider trading timed to perfection! Indo Count Industries Ltd approved the allotment of 28,98,300 stock warrants to promoters in the meeting on September 11, 2013, at a price of ₹17.25 per share (pre-split price, the post-split equivalent price would be 1/5 of it: i.e. ₹3.45 and the number of shares post-split would be 5 times: i.e. 1,44,91,500). The (post-split) share price of the company on September 11, 2013, was in the range of ₹5.44 meaning that the promoters had a gain of ₹2.9 cr [1.44 cr. Share * (5.44-3.45)] on the very day of allotment. The stock warrants are allotted by companies based on a formula, which is based on the share price levels of past 6 months and are allotted by taking 25% of the value at warrants allotment. The balance 75% of the money is collected when the warrant holder converts them into equity shares. In the case of Indo Count Industries Ltd, the promoters paid the 25% price of allotment i.e. ₹1.25 cr (1.44 cr. Shares * ₹3.45 * 25%), which the company disclosed in the FY2014 annual report, as share price money pending allotment. The above information indicates that the promoters paid ₹1.25 cr for something which was giving them a profit of ₹2.9 cr right on the day of allotment. An investor would notice that stock warrants are like call options where the holder has paid a premium of 25% of the value and would convert the warrants into equity shares by paying balance 75% only at the time of conversion the price of the equity share of the company is higher than the warrant allotment price. Stock warrants are usually convertible within 18 months from the allotment. An investor would notice that the stock warrants holder (promoter in this case) has got a right to subscribe to the company shares and increase her stake in the company at a predetermined price without worrying about the usual share price increase which happens if the promoters buy shares of their company from the open market. In case the share price does not increase, then the promoter simply lets the warrants expire. That’s even though the companies say that stock warrants are issued to the promoters in lieu of the capital infusion by them at times when the company needed funds. However, I call stock warrants a legal instrument in the hands of promoters/allottees to speculate on their company share price. And invariably, the persons to bear the cost of such speculation are the minority shareholders. An investor would see that the promoters infused ₹1.25 cr for allotment of stock warrants in FY2014. Looking at the financials of the company in FY2014: Sales of about ₹1,468 cr, net profit of ₹110 cr, debt of ₹434 cr and interest expense of ₹50 cr, the infusion of ₹1.25 cr by promoters seems insignificant in terms of overall financial position of the company and that too by calling a special extraordinary general meeting. If it was urgent, then Indo Count Industries Ltd could have collected this much amount by making a single phone call to any of their customers so that they may pay ₹1.25 cr from the outstanding trade receivables of ₹127 cr on March 31, 2013, and ₹167 cr at March 31, 2014. Such collection in the time of urgency would not have been difficult from long-standing customer relationships. Moreover, even if the company needed funds, the promoters did not infuse the balance 75% of the warrants funds i.e. ₹3.73 cr (1.44 cr. Shares * ₹3.45 * 75%), until December 20, 2014, which is good 15 months post allotment. If the stock warrants were allotted supposedly for the urgent requirement of funds by the company, then the balance 75% funds infusion would have come much sooner. However, even the balance 75% (₹3.73 cr) seems insignificant in terms of overall finance requirement of Indo Count Industries Ltd. Anyway, the promoters got 1.44 cr. shares (post-split) at December 20, 2014, at an effective price of ₹3.45, which is the original warrant allotment price. The post-split share price of Indo Count Industries Ltd at December 20, 2014, was about ₹60. Therefore, at the time of allotment of equity shares, the promoters had a gain of about ₹56.55 per share (post-split, ₹60 – ₹3.45), amounting to a total gain of ₹81.43 cr (1.44 cr shares * ₹56.55). Moreover, the conversion of stock warrants allowed the promoters to increase their stake in the company by 3.20%. The increase in stake in the company for the promoters comes at a very low cost of ₹4.97 cr (1.44 cr shares * warrant allotment price ₹3.45), which otherwise would have cost them about ₹86 cr (1.44 cr share * price at equity conversion date ₹60). This is without considering the almost certain possibility that if the promoters would have bought these additional shares from the open market, then the market would have taken the share price at a much higher level than ₹60. Further, there is a peculiar observation related to the timing of conversion of stock warrants into equity shares in December 2014. As per our analysis above, we have observed that from FY2014, the performance of the company had started improving a lot and as a result, the company came out of the corporate debt restructuring (CDR) in March 2015, which is just 3 months after the promoters converted their warrants into equity shares. No wonder, the promoters converted their stock warrants in December 2014, as they know the best out of all the people, about the financial position of the company at any point of time and that the company would be exiting the CDR very soon. 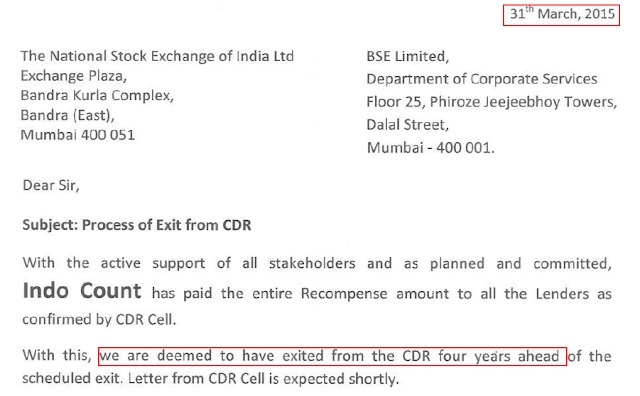 As is normally expected with a company showing improving business performance, after the exit from CDR, the share of Indo Count Industries Ltd raced ahead and touched the lifetime high of ₹249.69 on February 8, 2016, valuing the 1.44 cr shares (post-split) converted by promoters from warrants at ₹360 cr. It must be remembered that promoters got these shares by getting the warrant allotment at ₹4.97 cr. (1.44 cr share * ₹3.45 post-split allotment price). This is an example of someone having her cake and eating it too. Stock warrants are 25% beneficial to the company and 75% beneficial to promoters! In one of your recent articles on analysis of Granules India Limited, you have mentioned that allotting warrent to promoters is negative. I just wanted to ask if allotting stock warrants is negative even if they are allotted at a price higher than the current price of the stock. E.g. if a company’s stock is trading at Rs 100 and it allots warrant at 120, would that still be negative. One example is of Goodluck India. They have issued stock warrants at an exercise price of Rs. 125 when the market price was below Rs 90 (Dec 2016). Thanks for writing to us and bringing the case of Goodluck in our notice. This is the first case that we have seen that the stock warrants have been allotted at a price higher than the prevailing price. In all other cases, the allotment price was below the prevailing share price. In the case of Goodluck, it remains to be seen whether the promoters exercise their right to buy shares at Rs. 125/- despite the share price staying below the allotment price (₹125). An investor should note that stock warrants involve the promoters paying 25% of the money at allotment i.e. 125*25% = 31.25 per share at the time of allotment and would pay balance 75% i.e. 93.75 per share at the time of exercise of warrants and their conversion into equity shares within next 18 months. The price that the promoters would effectively pay total ₹125/- per share for getting shares irrespective of the market price of shares on the day of the exercise of warrants. Common logic says that anyone holding stock warrants would not exercise them to get shares at a price, which is higher than the price at which he/she can get shares from the market. More so, if the intention of the promoters is to infuse money into the company, which in the case of Goodluck is ₹125 * 1000000 warrants = ₹12.5 cr., then they should simply get all the shares at the current market price and give ₹12.5 cr. to the company so that the company may use it for the purpose for which it needs money. The entire gimmick of paying 25% now at the time of allotment of stock warrants and then keeping the option to pay 75% at the time of exercise, which the promoters would decide based on whether at the date of exercise, the promoters are making money or not, seems like a facade to us. If the promoters pay 25% now and let the stock warrants expire due to the market price being consistently lower than the exercise price in future, then it effectively means that the promoters did not have the true intention of infusing 100% of the money. Or that the company did not need 100% of the money. It might be that the company needed only 25% of the money, which promoters put in by way of stock warrants allotment and the right to get shares in future at a discount is the payoff that promoters would enjoy as a consideration for giving 25% to the company. The company might not need the balance 75% at all. Nevertheless, we believe that if the promoters wish to infuse funds into the company, then the company should straight away issue additional shares to them at prevailing market price and get 100% of the funds upfront rather than letting the promoters speculate at the company’s share price by holding back 75% of the funds as happens in case of stock warrants. Just to check if I understand correctly, so this (issue of warrents by Goodluck India) according to you is not an obvious red flag, but they could have injected money into the company more efficiently and in a less pretentious manner. We believe that if a promoter wants to infuse money into the company, then he/she should go ahead and straight away infuse the money by subscribing to additional shares at the prevailing price on the day. We do not appreciate the structured arrangements like stock warrants for the reasons elaborated in our response earlier. Share warrants above market price! What to do in case of share warrants given to the promoters at a price above the market price? Is it a positive sign? For example, I was going through the annual report of a company, I found it had issued share warrants for a price which was higher than the market price at that time and did not increase beyond it in next 18 months. Correct me, Sir, if I am wrong? Why did company issues share warrants at higher rate?? Any such instrument of part upfront payment and balance payment later with freezing of acquisition price should be seen with caution. Share warrants issued at a premium are still better than those issued at discount to current market price, as at least in the case of issuance at a premium, the interest of the promoters and minority shareholder are somewhat aligned. However, the concept of freezing of cost of conversion irrespective of future market price still benefits the promoters at the cost of minority shareholders. Share warrants might have been issued at a premium in the mentioned case as a result of the formula to determine the conversion price, which would have been applicable at that point of time. Doc, I recently came across situations where bankers force promoters to infuse money in a stressed company to disburse fresh loan or restructure existing loan. Promoters may not have sufficient capital available to infuse and may use warrant route to infuse part money for the time being and rest after 18 months. Bankers tend to take comfort and disburse/restructure the loan basis the warrant issuance. Thanks for writing to us and providing your valuable inputs. We believe that in a stressed company which is undergoing restructuring, the lenders are happy with whatever amount the promoters bring in in the form of equity. The company is anyway not doing good and not able to honour the commitment to lenders. In such a case any amount infused is good for lenders. Be it in the garb of warrants or any other form. Moreover, warrants do not dilute lenders’ stake in the company. Warrant have different implications for equity holders/minority shareholders and more so in companies, which are not stressed. Hope it clarifies our views.